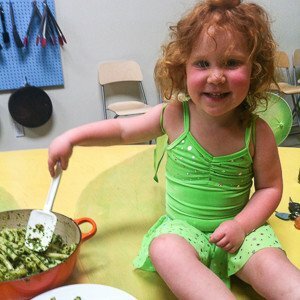 When the basil is exploding in your garden, grab your little cutie and harvest! Remove the basil leaves from the stems – an important step since the stems are bitter. In a food processor, whiz garlic and then add the basil. Then, while the motor is running, drizzle in olive oil until you have the right consistency. Don’t be surprised if you add an entire cup of oil for this! Then, pulse in toasted pine nuts. Finally season to taste with sea salt. To store in fridge, cover with about ½ an inch of olive oil. If you are making this pesto for pasta, you can add grated Parmesan, pecorino, Romano, Asiago, or a combination of these cheeses, but keep in mind that they will add saltiness and absorb oil, so you will need to adjust accordingly. 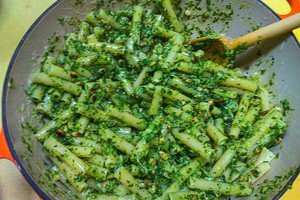 Experiment with other pestos, too, like walnut and cilantro, basil and almond, or parsley, garlic and lemon zest. The opportunities are endless!